For years steel moment frames have been a common method of providing high lateral-force resistance when limited wall space and large openings control the structural design. Ordinary moment frames consist of beams and columns, typically connected by a combination of bolts and welds to form rigid joints. 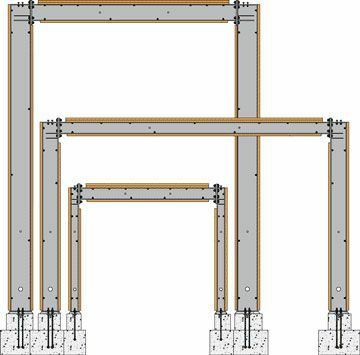 The frames resist lateral loads primarily through bending in the beams and columns. 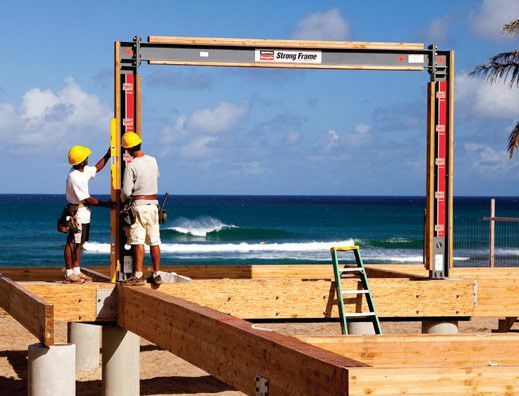 Stronger than site-built or factory-built shearwalls, moment frames allow larger openings and smaller wall sections while still providing the loads structural designers need. Moment frames are commonly used in applications such as garage fronts, large entry ways, walls with large, numerous windows, tuck-under parking and great-rooms. Traditionally, moment frames have been time-intensive to design and labor-intensive to install. Simpson Strong-Tie has taken these factors into consideration and has created a cost-effective alternative to traditional frames — the Strong Frame® ordinary moment frame. Use of ordinary moment frames is permitted in Seismic Design Categories A, B and C without limitations and Seismic Design Categories D, E and F, subject to the limitations set forth in ASCE 7-05 Sections 12.2.5.6, 12.2.5.7 and 12.2.5.8. Ordinary moment frames may also be combined with other lateralforce resisting systems in accordance with ASCE 7-05 Section 12.2.2 and 12.2.3. 100% bolted connections: Install frames faster with no field welding required. No need to have a welder on site, or a special welding inspector. A standard socket or spud wrench is all that is required to make the connection. Pre-installed wood nailers: Eliminate the need to drill and bolt nailers in the field. Frames fit in a standard 2x6 wall: No thicker walls, no additional framing or furring required. Pre-drilled holes for utilities: 1" diameter holes in the flanges and 3" holes in the column webs simplify the installation of electrical and plumbing elements. Greater quality control: Frames are manufactured in a production environment with comprehensive quality-control measures. 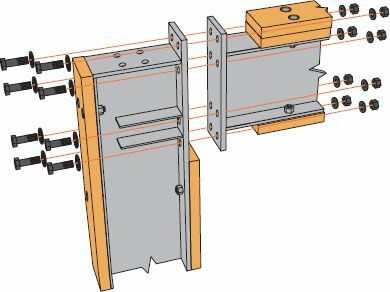 Field-bolted connections eliminate questions about the quality of field welds. Direct-tension-indicator washers included. 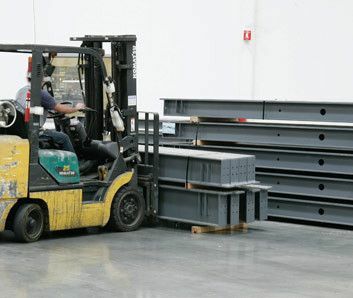 Convenient to store, ship and handle: Unassembled frames are more compact, allowing for easier shipping and fewer deliveries. Some sizes available pre-assembled: Contact Simpson Strong-Tie for more information. Code Listed: Strong Frame Ordinary Moment Frames are code-listed under the 2009 and 2012 IRC/IBC (IAPMO UES ER-164). The code listing includes 368 frame models as well as anchorage solutions. Now it is even easier to specify a Strong Frame moment frame — no calculation packages are required for the building department (but they are still available upon request or generated from the Strong Frame Selector software).